Natalie Barlow – Queensland Wildlife Artists Society Inc.
Natalie Barlow was born in Geelong. After finishing school, she studied Commercial art at the Melbourne College of Decoration and in 1987 attained a TAFE certificate in Promotional Display and Advertising. Since then she has worked as a graphic artist in Melbourne, Coffs Harbour, Sydney and now the Sunshine Coast where she has lived for 5 years. Since arriving on the Sunshine Coast Natalie has joined the Pomona Gallery Artists and Friends Group, the Friends of Noosa Regional Gallery and the Queensland Wildlife Art Society. She finds the groups to be very nurturing and supportive in her artistic development. Her interest in art started while studying graphic design. She commenced art classes in 1986 at the local community centre and soon developed an interest in painting wildlife, particularly birds and landscapes. 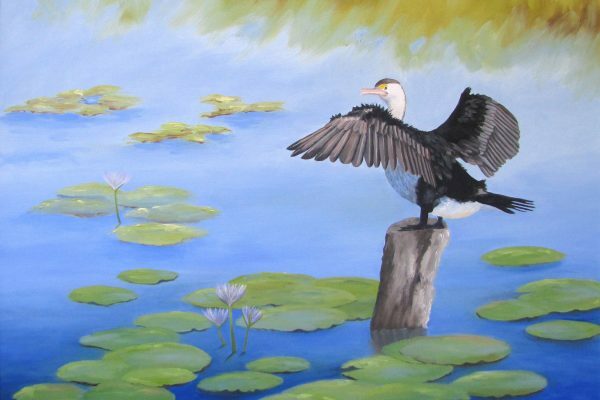 Over the years Natalie has gained inspiration for her artwork by visiting wetland areas, around Australia including Kakadu and overseas trips to India and Africa. Natalie enjoys painting in oils and watercolour and has exhibited in group and solo exhibitions and also has her paintings at Pomona Gallery. Last year Natalie had an article in the Artist Palette Magazine issue 143 which showed many of her paintings and a demonstration of a gum tree scene.